Douglas was prescient about sprawl and the trends between habitation and agriculture. MSD: The thing I said the other day in Tallahassee to the governor at the conference ... I think people are not realizing at all that the time is coming when there will be less and less agriculture, because the people will want the ground to live on, rather than to grow vegetables in. And I think, more and more, the people will crowd out agriculture also because it will be a fight between agriculture and people as to who's to get the water. Now, with a limited water supply, the agriculture is getting more water in proportion than people, but I don't know how long that can keep up. And I think eventually the development will cover just about everything that can be covered, I think that is the way the thing is heading. But the agriculture is not so important. I don't know if they believe me, I've said so. 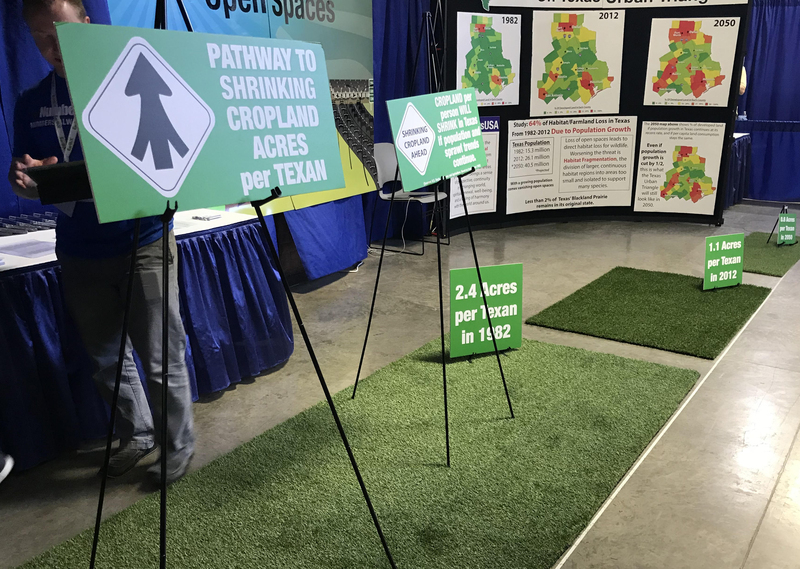 Note: NumbersUSA had an EarthX display showing how the acres of Texas cropland had been shrinking in relation to the number of Texans -- from 2.4 acres/Texan in 1982, to 1.1 acres/Texan in 2012, to a projected 0.6 acres/Texan by 2050. See the photo below and note the decreasing green turf sizes. Douglas understood that population growth was going to present great challenges to the management of natural resources in Florida Keys. MSD: "Sure. Of course the problem is...will be... Will they increase the population? That's where the great problem is going to come, whether even education is going to help with the explosion of population which is, I think, the great problem now. I have no idea how this is...whether it could...I don't think it can be stopped." And her warning about how population growth was affecting water supply sound relevant to today's western U.S. states. MSD: ...that is the basis. It will with all of us. They're going to have to put in desalinization plants at vast expense and the taxes will go up. Interviewer: So, the cost will be the controlling factor. MSD: So, I think water will be one of the controlling forces." Having grown up in Colorado, I've long appreciated that "whiskey for drinking, water is for fighting" (an adage that gained prominence in print around the time of these MSD interviews, ironically). There's some evidence already that we've overpopulated the West, and that water conservation efforts won't save us. With all due respect to the Florida Keys, a looming water shortage with a vastly larger population (those dependent on, say, the Colorado River) and a much more productive agricultural community (those dependent on, say, the Ogallala Aquifer) is likely to come with swifter fury and much further-reaching consequences when it arrives. Interviewer: There has been some talk for quite a while by some members of conservation groups about the necessity to halt population growth, or to slow it. MSD: It's almost impossible. How did they think that they were going to do that? Did they say? MSD: Course what they should do is stop all advertising, and they should even stop advertising for tourists because they get tourists down here and half of them come back. The only way they can possibly do it is to stop getting, urging people to come, and they won't do that. You can't get them to do that. Businesses, they always want more and more people, you see. They're cutting off their own noses to spite their faces because there is such a thing as a law of diminishing returns that will take place... and businesses will not succeed because there are so many people.. and that... even the businesses will have to change. But I think agriculture is going to feel the push first of all." I don't expect either Douglas or the interviewer to be omniscient. Douglas seems unaware here of the ongoing work of those like former Senator Gaylord Nelson (who was at that time the counselor for the Wilderness Society), or of the 1972 National Commission on Population Growth and the American Future recommendations that stated: "The Commission recommends that immigration levels not be increased..." from 400,000 yearly. By the time Douglas gave this interview, immigration levels were 550,000 yearly with a giant, "one-time" amnesty on the horizon. On the other hand, the interviewer's role here is infuriating. The questioner asks about the positions of "conservation groups," but evidently invested zero effort into understanding their position. When Douglas asked what the groups were proposing to accomplish a stated goal, the interviewer responded that they had no proposals. The interviewer would have done better if they had claimed ignorance ("I don't know"), or even to have been clear about the conservationists' means while expressing personal disagreement. Instead, the interviewer pivots to slandering the conservationists as basically all hat and no cattle, discredits the question they asked in the first place, and dismantles any basis for an informed discussion going forward here. I wish I could say that those of us who propose reductions in immigration don't meet these same tendencies in some quarters of today's media. While Douglas did not connect immigration to the growing U.S. population, there is no doubt today that the former is largely responsible for the latter. Pew Research Center has made it clear: 88% of U.S. population growth is Congressionally mandated, and it will result in a 2065 population of 441 million if we do not pressure Congress to act. Speaking of pressuring elected officials, Douglas (and fellow environmental activist Marjorie Harris Carr) had some words on that topic as well. Interviewer: I have one final question for you....What can an average person, average member of the public, do about problems like these, in the future, the ones that we've been discussing, these and the other ones we've been discussing? MSD: Well, they can understand...try to understand them first. Try to get them in terms they can express to other people and talk about it. About the best they can do possibly, talk and then bring political action to bear. M Carr: Right. Join some conservation group or several and keep in touch with their elected officials. Find out how to easily do it. The phone. Call a county commission office. Call their local congressman's office. Just no farther away than their telephone. To the centers of power! Interviewer: Tell me about, obviously both of you believe in the importance in educating the public and the importance of educating public officials, both elected and appointed officials, about environmental issues. That, of course, assumes that there is an open mind and there is an opportunity for those people to change their attitudes, when they understand more about an issue and when they hear that their constituency supports that change. Looking at it superficially, it seems that that process isn't working, with the present administration. MSD: I don't think that you can assume that they have open minds. You have to assume that they have closed minds. That's why we need pressure from the general public, from the electoral side. You've got to open their minds by force, if we have to. MSD: But we have to fight that. That's what we're up against more than open minds. Open minds, if their already open, then that's half the battle, but it's the closed minds, minds closed for special interests that are the problem." I hope Hogg (who has raised the importance of environmental issues before) will keep his high school's namesake in mind as he continues to use his platform for advocacy. Is population growth as crucially problematic as Marjory Stoneman Douglas believed? Was Earth Day founder Gaylord Nelson overstating when he stated, "But in this country, it's phony to say 'I'm for the environment but not for limiting immigration'?" Measured consideration of these complicated issues is essential to a #YouthVote that produces "morally just" representation. Good luck, David.